Data for this page come from five surveys carried out in the spring of 2001, 2004, 2007, 2010 and 2013 by Centre for Study and Research in Training and Education Policy (Céreq) on the young people who left the French education system in 1998, 2001, 2004, 2007 and 2010. These Céreq surveys on the occupational integration of young people into working life are carried out at regular three-yearly intervals. They provide the opportunity to interview a new cohort of young people leaving the educational system about their professional path during their first three years in the labour market. The scope of these surveys covers all young people leaving the education system for the first time, aged under 35, of French nationality, enrolled at an educational institution during the academic year in mainland France and residing in France at the time of the surveys. Young people who have interrupted their studies for more than one year (except for health reasons) are excluded from the scope, as are young people who have resumed their studies the year after entering the labour market. 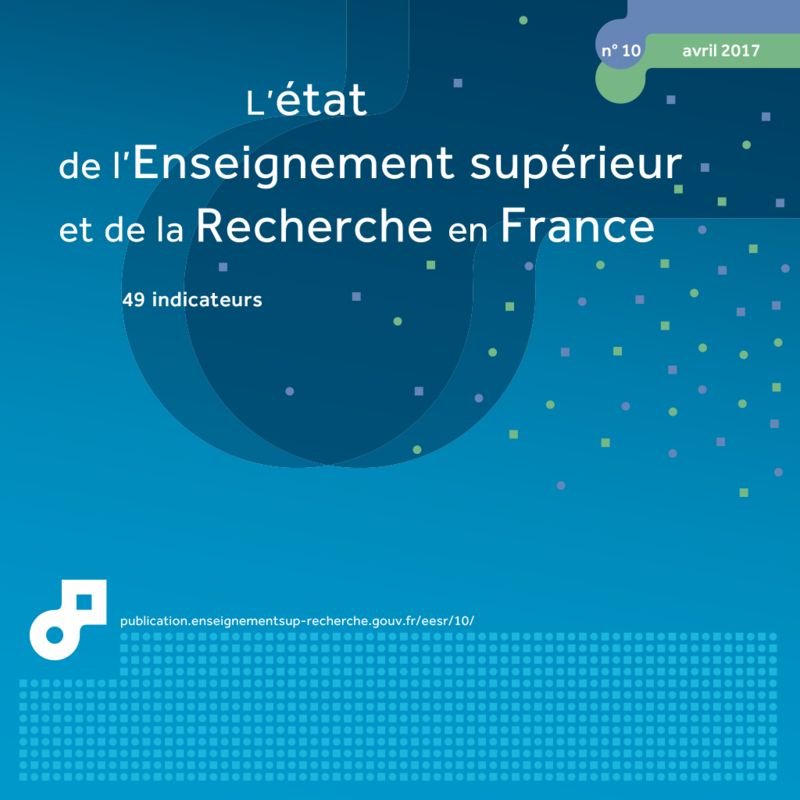 The number of PhD awarded in France between 1982 and 2010 increased from 7,000 to 13,000. Between 2001 and 2010, the professional future at three years of these graduates underwent two major changes: stagnation of the unemployment rate at three years at around 10% and a huge increase in short-term contracts in public research. The unemployment rate among PhD graduates after three years in the workforce rose from 7% in 2001 to 9% in 2013. However, whereas this rate was higher in 2001, 2004 and 2007 than for M2 leavers, the situation was reversed in favour of the PhD in 2010. The 2008 economic crisis had a more marked effect on the Bac + 5 leavers than the PhD holders. This recent improvement in the situation of PhD holders conceals huge differences between fields of education and not all PhD holders have benefited from the seeming stagnation in the unemployment rate since 2010 (table 39.01). PhD graduates in Mathematics, Physics, Chemistry and Earth and Life Sciences have not benefited from this upturn; in 2013, their unemployment rate at three years was 11% or more. Conversely, less than 9% of PhD graduates in Law, Economics and Management, Arts and Human and Social Sciences were unemployed in 2013. Engineering and Computer Sciences PhD graduates enjoyed an even more favourable situation, with an unemployment rate well below the others throughout the period in question. Opportunities for PhD graduates in employment after three years in the workforce are stable over the entire period in question (chart 39.02). Regardless of the survey year, nearly half of employed PhD graduates work in public research. Only 40% of PhD graduates work in the private sector. In both 2001 and 2013, over half of PhD graduates employed in the private sector have engineering or computer science backgrounds. Although the structure of opportunities has not changed through the various Generations, certain transformations deserve to be highlighted. In 2001, only 21% of employed PhD graduates from Law, Economics and Management were working in the private sector, but this proportion rose to 32% in 2013. In addition, during these ten years of Generation survey, employment conditions have changed significantly, with a clear increase in short-term contracts, especially in public research (chart 39.03). Thus, in 2013, nearly one PhD graduate in two employed in the public sector held a short-term contract after three years in the workforce, compared with one in five in 2001. This trend is in line with changes in the employment structure of higher education teachers where the proportion of temporary jobs has increased considerably over those of lecturers or professors. The increase in non-stable employment in academic research affects the PhD graduates differently depending on the fields of education (table 39.04). PhD graduates in Mathematics, Physics, Chemistry and Earth and Life Sciences have been affected especially by the increase in short-term contracts in the public sector. Between 2001 and 2013, the proportion of short-term contracts in public research rose from 24% to 45% for Mathematics and Physics graduates, 26% to 54% for Chemistry graduates and 37% to 75% for Earth and Life Sciences graduates. This rise is far less for the other PhD graduates. For Economics and Management graduates, the increase in the proportion of short-term contracts in public research jobs rose from 5% to 12% between 2001 and 2013. Extract from the chapter "39. change in occupational integration for PhD graduates over the last 10 years". 7% of PhD's were unemployed in 2010, three years after graduating. 43 % of PhD's graduated in 1998 were employed by public research institutions. 21 % of PhD's graduated in 1998 and working in public research institutions were employed with a short-term contract in 2001, three years after graduating. En France, on dénombre 200 000 titulaires d’un doctorat parmi les 25-64 ans. Il s’agit d’une population majoritairement masculine, au profil social beaucoup plus favorisé que la population générale. Les docteurs travaillent en majorité dans l’enseignement et la recherche où les débuts de carrières sont particulièrement difficiles. Une fois insérés sur le marché du travail, les docteurs connaissent les situations d’emplois les plus favorables aux côtés des diplômés de master et de ceux issus d’écoles d’ingénieurs et de commerce. La situation des docteurs face à l’emploi varie selon la discipline et le type d’employeur. Cependant, à caractéristiques égales, les probabilités d’accès aux emplois « supérieurs » et « très supérieurs » sont plus élevées parmi les docteurs que parmi les diplômés de niveau bac + 5. Elles dépendent aussi du genre et de l’origine sociale : les hommes et les enfants de cadres ont les probabilités les plus élevées d’occuper ces emplois.